The purpose of Empowerment 365 is to provide YOU with tools for personal growth and development each day for one calendar year. I am proclaiming this year as the year of Phenomenalism! Within this Phenomenal year your personal Empowerment begins with creating a Personal Development Goal. Sit for a moment and think of something that YOU want to work on or something that YOU want to change within your life. Become certain that YOU want to achieve this goal. Empowerment 365 is all about YOU and your individual development. I would like to wish YOU much success and look forward to hearing of the changes that will happen within your life in the coming months. With the Empowerment 365 YOU can listen to the Empowerment message of the day, relax and reduce stress in Marvin's Garden, submit a testimony or make comments that will motivate yourself and others along the way! Begin to become Empowered today, each day, everyday, one day at a time and watch change and growth unfold in front of your very eyes! As YOU go through the process of Empowerment it will become important to practice each day learning the foundation for Personal Empowerment. The Foundation begins with goal setting and the establishment of a daily practice that will allow YOU to consistently "do" the things that will create the success in life that YOU desire. Within the Empowerment concept Personal Development means working on YOU! The task ahead, is for YOU to put forth the Effort to achieve your goals daily. How will YOU do this? By demonstrating your Ability to "Simply Try" each day to reach your goals by and consistently utilizing your tools for personal Empowerment! Before beginning Empowerment 365, read over and become familiar with the Empowerment tools and Empowerment Pledge. The Pledge is a commitment that YOU are making to yourself. A commitment to do the things necessary to achieve your goals, the things that will allow YOU to work on and Change YOU! Personal Development: To work on "YOU"
Change: The results that YOU get from the demonstration of your Ability "To Do"
YOU - The nature, character or unseen identity of the person or individual Within. Gratitude - Thankfulness, gratefulness, or appreciation is a feeling, emotion or attitude in acknowledgment of a benefit that YOU have received or will receive. Forgiveness - The action or process of forgiving or being forgiven. Humility - Person or individual knowing self as YOU truly are. Balance - An even distribution of (energy, thought, focus and faith) enabling YOU to remain upright and steady. Focus - The central point of YOUR attention or the center of YOUR interest or activity. Faith - Complete trust or confidence in YOU and in YOUR own ability. 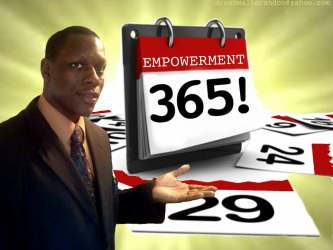 The goal of Empowerment 365 is to create a foundation for personal Empowerment. We began this process by introducing and combining the Empowerment tools of gratitude, forgiveness and humility to assist in creating balance within your life. Each day we begin the day with practicing gratitude. First, beginning each day with thoughts of appreciation for life and health. Without those things we could not truly enjoy life very much, could we? We then discuss and implement the practice of forgiveness. Forgiveness is important because we have to release and let go of the past (people, events, actions, activities of self and others) and to fully live in the present. We must forgive ourselves for actions and choices of the past. We must remember that we all can learn and grow from each experience in life and that each experience prepares us for our future. Lastly, there is the practice of humility. Humility is important because we must learn to become humble. This requires us not to be boastful, prideful or arrogant. The concept places value on others the same as we would ourselves and being of service to others in our daily lives. The Empowerment promotes love for self, this love for self is not a selfish, self centered love, but a true genuine love for the person that YOU are on the inside (within). We then discuss the importance of our thoughts and the way we feel each day. It is important to understand that our thoughts and feelings are an important part of our lives. They both are internal and both can shape the way we see and experience the world around us. Begin to practice making all of your thoughts and feeling positive and productive. Make the way YOU feel the most important thing in your life today and each day. The next step is to introduce the concept of personal development (to work on self) and effort (to simply try) as tools of motivation and direction within the process. Throughout this Empowerment process, I will sprinkle in and define key word such as, intent, focus and commitment. As the days and months continue to pass by, YOU will experience through your own ability to consistently work on self "change". Change and personal growth is what Empowerment 365 is really all about! I wish YOU continued success on your journey toward personal development and self improvement each day, everyday one day at a time. The goal of Empowerment 365 is to create a foundation for personal Empowerment by introducing and combining the Empowerment tools of gratitude, forgiveness and humility with relaxation and visualization to assist YOU in creating balance and focus within your life. We end each day with practicing gratitude and forgiveness. Each day ends with quiet reflection and thoughts of appreciation for life and health. The process assists in creating balance in your life by mentally and emotionally releasing the events of your day each night prior to sleep. We then develop the practice of visualization to relax and release of the issues of the day. We also implement the use quiet space and quiet periods prior to ending the day to practice relaxation techniques. Lastly, we review our goals and encourage YOU to turn off the TV and rest peacefully. The quietness of sleep allows YOU to rest and quietly sleep without disturbance. Begin to work on YOU today, each day, everyday, one day at a time. Tell a friend about Empowerment 365!